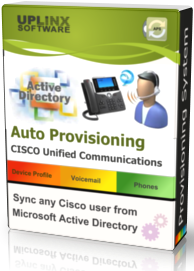 Any combination of Cisco phones, Jabber, CSF, RDP with auto allocation of extensions from the site extension range. Shared extensions and pre-allocated extensions are also supported. CUCM end-user with roles, associated devices, owner userid and voicemail extension. Device Profiles for Cisco Extension Mobility - Simplify phone deployment by reformatting auto-registered phones to site specific logged-out phones. There are no other steps involved other than plugging the phone in on a desk. For increased security, approval by help desk can be mandatory. Automatic, assigned or approved allocation of extensions from site pools. Write-back of user's extension to AD. Voicemail on Cisco Unity Connection or Microsoft Exchange. An email can notify the end user of their setup and how to use their telephony device and can also include attachments for training purposes.